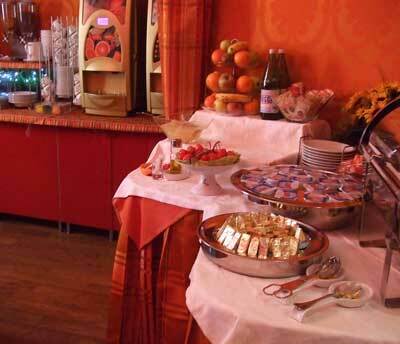 The Relais Fontana di Trevi offers four-star-hotel-standard rooms in the heart of Rome right by the Trevi Fountain. I stayed for two nights in February 2008, and found it a comfortable and practical base. I booked three days before travelling, through Booking.com, and found a double room with a price of 100 euros per night for single occupancy. Although this wasn't a bargain, the price did compare favourably with other hotels in Rome for the same dates. This can be an expensive city to stay in, so I felt that for a four-star hotel with good reviews and a great location it was (again, comparatively) good value for money. As soon as my booking was confirmed I received, as well as the standard confirmation email, a friendly email from the hotel with a welcome and details of airport transfers. 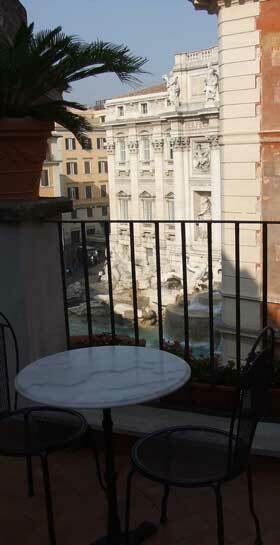 The most striking thing about the Relais Fontana di Trevi is the location; right by the Trevi Fountain. It is on a little lane leading away from the fountain, just a few doors up. Some of the bedrooms, and a small breakfast/bar terrace have an attractive partial view of the fountain. I refer to the enterprise as a hotel, but perhaps it doesn't officially qualify as a four-star hotel, since it lacks public space and amenities. It basically consists of very comfortable bedrooms, a small first-floor reception area, a breakfast room and terrace. The hotel's entrance - an anti-climax after the excesses of the Trevi Fountain - is a humble doorway with the name of the hotel just above it. It opens into a narrow carpeted corridor with stairs leading up to the reception area on the first floor. There is a small lift, but it is one of those (common in Rome) which stops on the stairway between floors, so you'll still have some steps to manage. The staff were good at appearing to help with luggage, though. I had a momentary excitement on arrival when I was offered an upgrade and shown to a large front room - only for the porter to notice someone else's possessions. So after a brief wait I was re-allocated to the standard room I had booked. My room is a good-sized double room, with a large firm bed. The decor is pleasant in a peaches-and-cream way; with fabric-covered walls and an attractive wooden floor. The bedroom has been decorated with attention to detail, and not on the cheap. Furniture comprises: a small desk, a suitcase stand, mirror, coat hooks, a padded stool, an upright chair, two little bedside shelves, and a wardrobe set into the wall with plenty of hangers inside, some drawers, a safe and a spare quilt. An LCD tv screen is fixed to the wall - I tried to turn it on, failed and then forgot to try again or to ask for help. The best feature is a kettle and a welcome tray with tea bags and instant coffee. There is no milk, but this is still a step beyond other Italian hotels. The small fridge contains two free bottles of mineral water again demonstrating the hotel's attention to detail: one is sparkling, one is still. There are sufficient electricity sockets by desk and bed (again, this is not standard in Italy) and I particularly appreciate the goodnight card and chocolate placed on my pillow. My en-suite bathroom is a comfortable size and nicely-decorated. It has a fancy shower with a mirror and water-jets. The bathroom also has shelf space and a good make up/shaving mirror. Unusually, there is no bidet. The hair-drier is attached to the wall and is not very good; possibly the one thing that lets the room down. There are free toiletries and oddments: dental and shaving kits, soap, shower gel, shampoo, showercap and slippers. I didn't spend a great deal of time in the hotel room during my stay, but I actually wished I could. As well as being extremely comfortable it was also amazingly peaceful. It was at the back of the building, looking over a courtyard space with a little children's play area (not used when I'm around). Occasionally I heard footsteps, church bells, the lift or plumbing sounds but generally the only sound was of my own fingers typing. I am a light sleeper and I would never have expected such a silent room in the heart of Rome; no traffic sounds, no sirens, no garbage trucks. Breakfast is taken on the third floor in a couple of small, warm and over-enthusastically decorated rooms, or on the adjacent terrace (not in February when I visit). Hot drinks come from a machine - there are teabags and pots but no jugs for milk, necessitating a bit of invention. Two fruit juices (watery,sugared) are also from a machine. The bread doesn't look special, but there's a toaster, nice little filled croissants, yoghurts, cold meat and cheese (served with the same fork, which isn't good for vegetarians) and scrambled eggs with sausages. I don't much care for the MTV soundtrack but otherwise, for Italy, this is a pretty decent breakfast. The terrace is little but very picturesque; there's a small bar here in warmer months. Wireless internet covers the hotel and is free and efficient; a real boon if you are travelling with your own computer and want to get connected. The international staff are helpful and friendly, defaulting to the English language. The receptionists and porters were always around and ready with a friendly greeting and offers of assistance. They kept my luggage securely after check-out, and I was grateful for the opportunity to return during the afternoon and use the wireless internet once again before my departure. Hotel address: Via del Lavatore, 44. This is the lane heading up to the right as you face the the Trevi Fountain. The nearest Metro stops are Spagna and Barberini. There is a small bus terminus nearby in Piazza San Silvestro, and the 175 from Stazione Termini also stops on Via del Tritone, close by. Arriving and leaving you do have to dodge the crowds of tourists around the fountain, as well as the many dodgy salesmen brandishing pointless plastic goods. You can feel smug, though, as you dive through the mob and head into the hotel. It's a good location for the main shopping areas and the Centro Storico is a short walk away - cross Via del Corso and it's only a few more minutes to the Pantheon. It's quite good for transport too; Piazza San Silvestro is a hub of the city's bus network and you can catch a bus in almost any direction within five minutes' walk of the hotel. There are always municipal police on duty by the fountain (partly to stop drunk tourists diving in, or thieves stealing coins) which I found reassuring when I returned alone at night. I loved the opportunity to see the fountain at different times of the day. I headed out before breakfast and found the water switched off while council employees were 'vacuuming' up all the coins thrown in the previous day. Initially I was a little disappointed with the lack of a traditional hotel feel, although I know that the steps-to-reception set-up is typical in Rome. But I really appreciated the comfortable room and the consideration shown in furnishing and equipping it. The kettle and tea really makes an overseas traveller feel welcome - I find it amazing that so few hotels in Italy have thought of making the effort. The staff were almost over-eager to help, breakfast was pretty good and the free wireless internet access was another welcome touch. The location suited me, and I'd recommend the Relais Fontana di Trevi to travellers wanting to stay somewhere picturesque yet practical too. It's not a sense-of-occasion hotel, but if you're looking for a comfortable place to spend the night it's a good choice. This hotel is one that states during the booking process that it 'reserves the right to pre-authorise your credit card'. In my case, the hotel charged my credit card double the amount of my stay, processing two transactions on the day I checked out, under different business names. In response to my email they assured me that this was just the pre-authorisation process and one transaction would vanish. A week, a couple of phone calls to my bank and another email later they admitted that their bank had made an error, and the duplicate charge would be refunded - which it was, very promptly. Presumably an honest error, but it serves as a reminder that you should always keep a close eye on your credit card statements, especially when you are travelling and using cards frequently. Relais Fontana di Trevi hotel review by Italy Heaven editors.